The objective for this PhD study, funded by the Scottish Graduate School for the Arts and Humanities (SGSAH), was not only to ask questions about how the police can appropriately serve deaf people, whose preferred language is British Sign Language (BSL), but also to raise awareness about how deaf people can and should be included in the development of our publicly funded services. The study seeks to investigate the way video-mediated interpreting (VMI) services may be utilised to facilitate access to Police Scotland for deaf British Sign Language (BSL) users in Scotland. VMI services are remote call centres that can dispatch specialist interpreting services on demand using high speed audio-video internet technology. In the UK VMI services are being used by deaf people to facilitate a range of interactions such as telephone banking, work place interactions, medical appointments. The potential to extend the use of VMI to facilitate ad-hoc and unexpected encounters between a police officer and someone who is deaf is great but remains to be proof tested. In addition to testing its suitability the question around appropriateness has also yet to be considered – do deaf people consent to the use of technology and interpreting services in this way? Robert won the SIPR-Police Scotland Postgraduate Student Award for the Best Presentation at the Postgraduate Conference held on 15th December 2017. The objectives of this PhD project is to produce recommendations for Police Scotland policy relating to when and how to make use of VMI services; the technological set-up required to meet the needs of Police Scotland to ensure that deaf BSL users have appropriate access; sign language interpreter training aimed at working in policing settings and video interpreting contexts. The Scottish parliament unanimously voted through the BSL (Scotland) Bill, which later received Royal Assent on 22nd October 2015. Scotland is the only part of the UK that has officially recognised the deaf community as a linguistic and cultural minority group. Scottish public authorities, including Police Scotland, are now working in collaboration with the deaf community to develop a range of national strategies that will see BSL integrated into everyday life. The ambition is to be the best place in the world for BSL users to live, work and visit (Scottish Government, 2017). Following the BSL (Scotland) Act the Justice Sector partners for Scotland have begun their consultation with the deaf citizens. The process has been about opening dialogue that will hopefully create a social contract between the bodies like the police and the deaf community (see http://www.gov.scot/Publications/2017/10/3540). Part of this consultation has included ways in which organisations like Police Scotland can make greater use of video-relay services (VRS), a remote interpreting service, to facilitate police-civilian interactions. In Scotland a national online VRS is already available and free to use, this service is called ContactScotland. 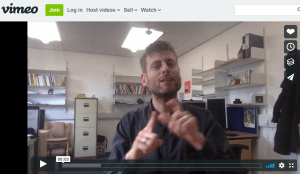 ContactScotland was a demonstration of the Scottish Government’s commitment to providing equal access to public services and non-governmental organisations for Scottish deaf BSL users (see: http://contactscotland-bsl.org). Established in 2014, deaf Scottish citizens whose preferred language is BSL have the opportunity to make independent and direct contact with Scottish public authorities (See Figure 1 for a description of how the service operates). In England and Wales a patchwork of VRS provisions exists and relies on private and public organisations to fund their own bespoke VRS. 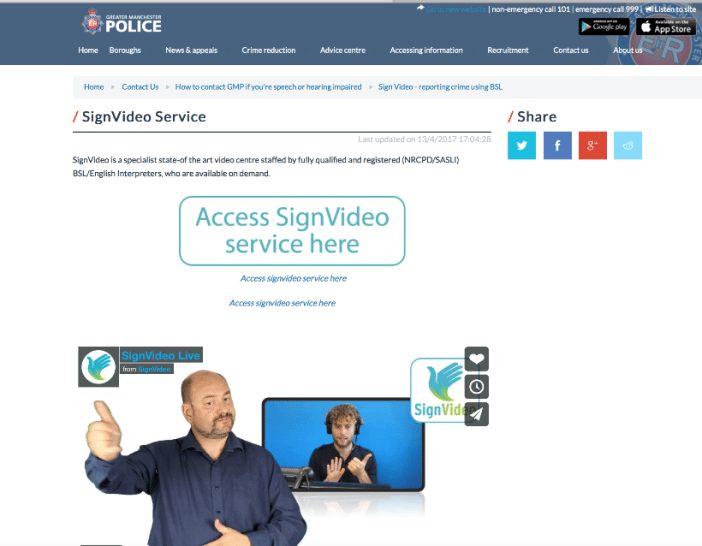 Greater Manchester, Leicester and Northants police forces have respectively recognised the need to provide ways for deaf people to contact the police, in line with the Equalities Act, by establishing their own bespoke VRS 101 non-emergency service (Greater Manchester Police, 2017; Leicestershire Police, n.d.; Lumsden & Black, 2017; Northamptonshire Police, n.d.). The VRS service can be located by pressing a ‘call button’ via a designated webpage (see Figure 2 as one example). This VRS service concept is similar to the existing spoken foreign language telephone interpreting service used by police forces nationwide. My PhD is interested in investigating the use of online platforms, like VRS, to facilitate police-deaf civilian interactions. Currently the model is restricted to 101 non-emergency but there are other ways to possibly expand how technology is used to provide appropriate linguistic access to policing services. Figure 3 demonstrates other ways technology can be used to facilitate police-civilian encounters. For my research I plan to simulate and critically analyse police-civilian interactions mediated by a remote interpreter. I want to look at how police-civilian interactions can progress where personal matters can be appropriately recorded, well-being assessed and subsequent steps be agreed. These encounters will rely on the awareness and assistance of a remote interpreter. With this in mind, there are two overarching questions that guide my critique of using technology in this context. The first looks at how all three participants, the police officer, the interpreter and the deaf civilian spontaneously come together to create and exchange knowledge and information; the second is concerned with the social acceptability of an online policing service to meet the needs of deaf civilians. The success of the human and technical abilities can only form one part of the evaluation. Social attitudes and values must be considered to determine its likely success. For my scoping study I looked at how four regional forces (Scotland, Greater Manchester, Leicester, and Northants) along with two video interpreting providers developed a bespoke 101 non-emergency video relay service (101 VRS). The development of these services was done with a range of stakeholders: the police, video interpreting providers, interpreters and deaf representatives. To evaluate the collective development of 101 VRS I applied the Social Construction of Technology (SCOT) framework, a branch of Social Shaping of Technology (SST) studies (Bijker, 1995, 2009; Pinch & Bijker, 1984). The SCOT framework seeks to describe the range of ontological and epistemological experiences in using technology to understand its future trajectory. In the case of 101 VRS the SCOT framework is useful in evaluating the shared conceptual understanding and to determine any potential power imbalances. I found there was a cautious roll out of the online video interpreting platform because of insecurities around the technologies and capabilities to communicate clearly and effectively. For deaf people their immediate sense was “more needed to be done to achieve parity of service”. Searching for a designated webpage was not an instinctive process. A concept like this was heavily dependent on social networking to raise its profile. Deaf respondents wanted to see a more universal concept in how the service was disseminated; currently deaf citizens have to move between different systems, including downloading multiple apps, because VVMI providers used different software technologies. Deaf people were insecure about interpreter quality and valued the real-world physical contact. It was explained that when a deaf person can visually see the officer there is less reliance on the interpreter, instead the civilian can make informed judgements based on the officer’s physical mannerism (e.g. sincere, attentive, aware, aloof, tired or frustrated). For interpreters they saw real benefit in using the technology to cover certain police-citizen interactions. Interpreters reported on having to deal with pressure, from the public and police, to extend this concept to other forms of police-civilian interaction. This was because the caller had no other service to turn to. Interpreters were asked to assist with the taking of statements, supporting police with home visits and 999 emergency calls. Currently, these requests go beyond the original scope of a 101 VRS concept, suggesting that there is a level of demand. The reluctance to go beyond the 101 framework was related to the unreliability of technology (e.g. the caller’s low bandwidth or weak wifi signal) or misusing an online service when an onsite interpreter could and should be used. Onsite interpreting has been argued to produce better results and user experience. Despite the guarded approach, all of the stakeholders believed the technology had the potential to be used in a number of ad-hoc police-civilian encounters. Independent testing of the platform was put forward as a way to determine appropriate use of the technology. For more information please visit my website www.proximityinterpreting.com. This entry was posted in General posts, Police-Community Relations, Public Protection and tagged community policing, engagement, local policing, mental health emergency, partnerships, problem-orientated policing, standards of practice, Technology. Bookmark the permalink.